2011 Hyundai Sonata Hybrid - As global automakers work out implementation timing for new fuel-efficient powertrain technologies such as gasoline direct-injection (GDI), twin-scroll turbochargers, and full-hybrid powertrains, Hyundai announced that the all-new 2011 Hyundai Sonata is the first vehicle in the industry to offer all three technologies with the new Sonata 2.0T (turbo) and Hyundai Sonata Hybrid joining the hot-selling GDI-equipped Sonata in Hyundai showrooms in late 2010. 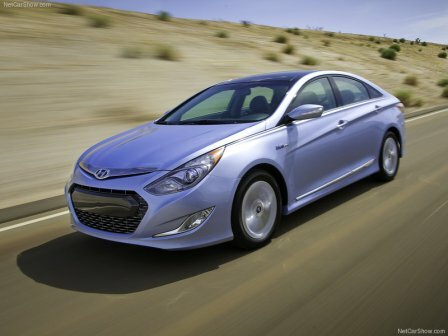 At the 2010 New York auto show, Hyundai unveiled its 2011 Sonata Hybrid, changing the game in hybrids with unique approaches in hybrid powertrain design, battery technology and vehicle appearance. 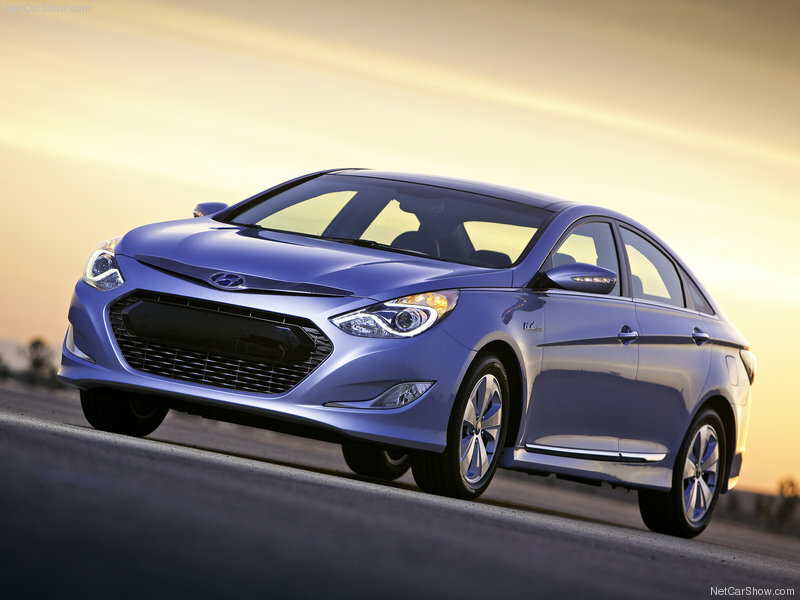 The Sonata Hybrid is Hyundai's first hybrid in the U.S. market. "The Hyundai Sonata Hybrid is the new kid on the block, but it's not a follower," says John Krafcik, president and CEO, Hyundai Motor America. "Its full parallel hybrid configuration and breakthough lithium polymer batteries offer a new take on traditional hybrid design, while its unique design sets it apart from the mid-size hybrid pack." The Hyundai-developed Hybrid Blue Drive architecture is a full parallel hybrid drive system, which can operate on an electric motor, gasoline internal combustion engine, and a combination of the two depending on driving conditions and driver demands. Hyundai's proprietary full parallel architecture differs from the power split technology used by most competitors, allowing significant efficiency advantages at higher speeds. Hyundai Hybrid Blue Drive is the first and only system using lithium polymer battery technology - leapfrogging competitive in-market nickel-metal hydride and lithium-ion applications. Lithium polymer offers the benefits of lithium-ion, a technology used in laptops and cell phones, but adds robustness, power-density and package flexibility, making it ideal for automotive applications. Hyundai Hybrid Blue Drive also is unique in its use of the company's own highly efficient, compact new 6-speed transmission, modified with hybrid starter-generator, electric motor, and low-friction oil pump, which together allow the elimination of the traditional torque converter. Hyundai Hybrid Blue Drive is a new addition to a full suite of eco-focused products and technologies that Hyundai offers in its goal to be the auto industry's global eco-leader. According to the EPA, Hyundai has led the U.S. industry in fuel economy for 2008 and 2009, and is currently the only automaker with average fleet fuel economy of more than 30 miles per gallon. "Hyundai applies advanced technologies to vehicles to provide the best solutions for the everyday driver," said Krafcik. "Unlike traditional hybrids that trade off highway fuel economy for higher city ratings, the Hyundai Sonata Hybrid delivers best-in-class highway fuel economy, while still delivering about a 40 percent improvement in city fuel economy compared to a Sonata equipped with the Theta II GDI engine. We think this is a better balanced approach for the majority of car buyers." Title post 2011 HYUNDAI SONATA HYBRID with url http://luxcarwallpaper.blogspot.com/2010/09/2011-hyundai-sonata-hybrid.html, please give comment about the latest 2011 HYUNDAI SONATA HYBRID.